Marieann from Windsor, Ontario, wrote to tell us ... February 10 2016 - I've never seen them this early. Usually our first sighting is the beginning of March. Jean Taylor of Toronto wrote to tell us ... I saw 12 robins in my neighbour's backyard apple tree on February 10th. They were feasting on the rotten apples. Seems too early and too cold for them to be back so early. One nature lover said ... My big fat Robins have returned to my back yard, February 18th 2016. Always feel like spring is here when they return! February 21 2016, one of our readers wrote to say ... I live in northern Ontario and today I saw my first Robin of the season. Is this too early? Another reader wrote to say ... 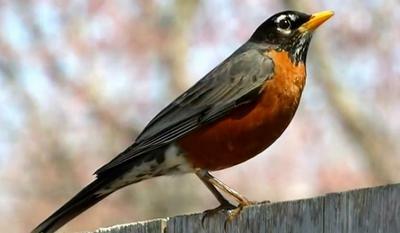 I woke up this morning to a flock of Robins in my backyard! This was February 22, 2016 in LaSalle, near Windsor, Ontario. Barb Stone wrote to tell us ... I saw four Robins today, February 23, 2016, just west of Stirling Ontario. From Orangeville, Ontario, one of our readers reported ... It's March 1, 2016 and -9 with a storm coming in and I have about a half dozen Robins in the crab-apple tree - what a lovely sight to see, the promise of spring. March 17 St Patrick's Day visitor ... I was so surprised and happy to see my first Robin in our crab-apple tree. That is the earliest I have ever seen one - we are in Feversham on top of Blue Mountain. We still have lots of snow on the ground. I had one robin stay all winter, living in my mountain ash tree, it was full of berries & still is!! He chased off any other birds trying to eat the berries!